Manan sprang onto the railway tracks, hurrying to get across. The next few steps he took changed the lives of his wife and three children forever. As he crossed the tracks, he wasn’t aware of the train coming his way. Suddenly his body lay crumpled on the railroad tracks. Now his children were without a daddy, and his wife would bear the name of the despised: widow. Gulika’s life drastically changed the day her husband died. Although she and Manan were not well off, Manan worked faithfully as a tailor, and they managed to have just enough to live on. Now Gulika and her children were left helpless, and they took on the burden of deep, unforgettable sorrow. Bearing the title “widow” was a heavy weight to carry too. The sharp, condemning words of the villagers stung Gulika’s already broken heart. Because of this, the pain of losing her husband increased all the more. It seemed that every time she stepped out of her home she wasn’t safe from their harsh criticism. Gulika’s life drastically changed the day her husband suddenly died. The villagers believed Gulika was cursed. They were even afraid that if she passed them on the street, she would bring them bad luck. This shame and rejection, on top of the reality of her husband’s death, grew unbearable. Soon Gulika fell into deep emotional despair. Although Gulika suffered from despair, she had certain duties to uphold as a daughter-in-law: Gulika had to get water for the family. Unfortunately, the nearest source of water in the village was an old well that was a-third-of-a-mile walk from her home. In Gulika’s village, collecting water was a grueling chore, one which involved much fear and danger for women and young girls. Even as a widow, it was dangerous to go out alone because men would take advantage of their vulnerability. When Pastor Gobhil heard about Gulika and her family, he visited their home, hoping to bring them comfort and encourage them through God’s Word. He said there was hope for their helpless situation and shared about a faithful God who could heal Gulika’s suffering heart. Over the course of time Gulika, was completely restored! Through the power and love they experienced in Christ, Gulika and her in-laws found hope in the midst of their sorrows. 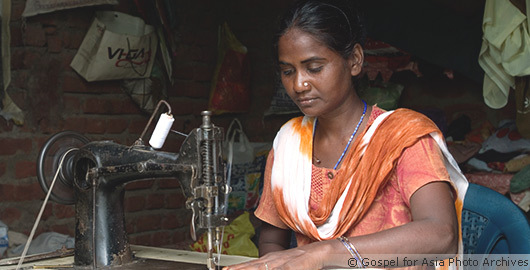 Pastor Gobhil encouraged Gulika to start sewing women’s clothing, and soon the church was able to supply her with a sewing machine. Pastor Gobhil encouraged Gulika to start sewing women’s clothing, and soon the church was able to supply her with a sewing machine. Gulika began to earn a respectable living through this vocation, and despite the way the villagers treated her, she knew God did not condemn her but rather valued her life. But even with her new income and life in Christ, Gulika still faced harassment from her neighbors, especially when she went out to fetch water for the family. There were days when she didn’t come home with enough. 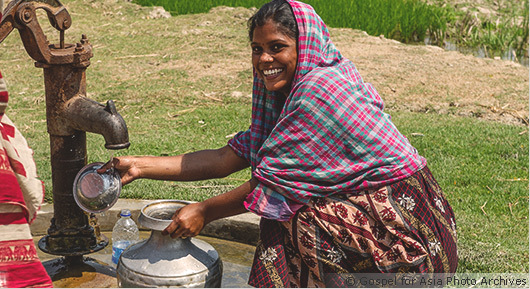 Pastor Gobhil noticed Gulika’s and the villagers’ struggle for water. Eventually, Gospel for Asia drilled a Jesus Well right in front of Gulika’s house. She now can get water easily without fear or disturbance. The other villagers were very grateful for the Jesus Well. Now when people use the Jesus Well near Gulika’s house, she shares with the villagers about the sweet love of Jesus and how He has given her hope and security. She is thankful for the church and Pastor Gobhil because of all the help and love they have poured into her life. “In my time of trouble, when my husband died, [The Church] helped me to be strong and have confidence to work and earn an income,” Gulika says. The villagers are very grateful for the Jesus Well, and they respect the Christians after seeing their love and care for the widows and the needy. You can be part of reaching these women practically with items such as sewing machines, food, clothing and hope. Give toward the Widows Fund today and help tell a woman she is dearly loved! Your gift can help restore dignity in the lives of broken women in Asia.